If children throughout the 20th century delightedly developed their engineering skills by playing with Meccano, a Russian startup hopes that 21st-century children will find its robotic constructor kits no less fascinating – and educational. 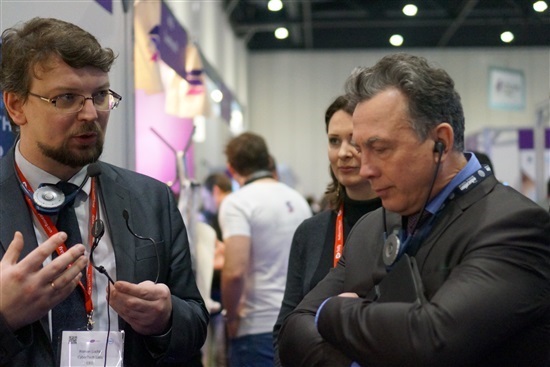 Roman Luchin of CyberTech Labs talking to Deputy Education Minister Veniamin Kaganov at the Bett education technology show in London last week. Photo: CyberTech Labs. CyberTech Labs, which exhibited its wares at the Bett education technology show in London last week, aims to transform robots from a futuristic dream for most children into something they can build in their own bedrooms or at school with the help of its TRIK kits. “Our product is based on three kits,” explains Roman Luchin, co-founder and CEO of CyberTech Labs, a resident startup at the Skolkovo Foundation’s Robocentre. “The first is a powerful control pad that we developed ourselves that makes it possible to realise complex algorithms. Thanks to this controller, the robots can learn to see, hear and connect to the internet, as well as to anything else that can be connected to,” he said. “The second contains software and TRIK Studio educational media developed by CyberTech Labs. The third comprises teaching materials, master classes and video tutorials that teachers can study themselves and use in class,” said Luchin. The kits made by the St. Petersburg-based company can be used to make anything ranging from a remote-controlled car to a drone. The kits are priced from 24,900 rubles to 90,900 rubles ($325 to $1,200), depending on the size and number of components such as engines, and are designed to make it possible to build devices that are powerful, yet simple and quick to make. “Our clients are mainly robotics clubs and educational establishments, as well as companies that provide equipment for schools and after-school activity clubs,” Luchin said, whose company is mentored at Skolkovo by Antonina Tsitsulina, head of the Association of the Children’s Goods Industry, and Olga Lombas, head of Lego Education in Russia. At the giant Bett show, which was attended by representatives of state education ministries, including a Russian delegation led by deputy Education Minister Veniamin Kaganov, CyberTech Labs talked to a range of European companies and identified several potential partners, he said. CyberTech Labs has clients in the U.K., China, Germany, Singapore and Poland, and plans to expand further in 2016. “This year we plan to open distribution centres in Singapore and France to work out of them on the Asian and EU markets,” Luchin said, adding that several universities in France had also bought their kits. He said that attending the Bett exhibition, where CyberTech Labs shared the stand of 1C, a major Russian software developer, had also helped to boost its presence in its native Russia. “Our Russian-speaking colleagues in the delegation were also impressed – paradoxical though it may sound, it was worth going to London to surprise our compatriots,” he said.